In the following report I have written the history of the Parks and Recreation Department, according to my findings. My sources are listed on the final page of this report. I felt this necessary because of the various sources that I used to derive my information. In 1941 a City Ordinance provided for the development of a Board of Parks and Playgrounds in Bowling Green Kentucky. This was 144 years after Bowling Green was established as a city. The time span seems long, but this area was not without parks and recreation during that time. When the Moore brothers settled the area in approximately 1797, they set-up a game called "bowling on the green" which is where the city derived its name. Robert Moore dedicated two acres of this land for public use. The property had a spring in the middle of it and is presently the site of Fountain Square in downtown Bowling Green. The above Ordinance also listed eight pieces of property that were "to be dedicated forever as a public park and playground". Those properties were: Fountain Square, Covington Woods, Reservoir Hill, Pioneer Cemetery, West End Park, space between College and Center Street in line of 2nd Street and the triangle corner of Center and 14th Street. A five member board was appointed to manage and control the newly established system. Their supervisors were to be the Public Works Department. As the population of Bowling Green grew over the years, it was clear that a permanent structured Park System was needed. On May 6, 1957 an Ordinance abolished the one made in 1941 and the Board of Parks and Playgrounds created a Board of Park Commissioners within the Department of Parks and Recreation. The Ordinance states "the operation and supervision could be accomplished in and even more efficient, orderly and economic manner if the Administration there of would be delegated an administrative department of the city. With the Parks and Recreation Department merged into a larger system, two Advisory Board Commissioners were added to the original five. They divided the Department into three different areas: Parks and Playground Division, Golf Course Division and Swimming Pool Division. 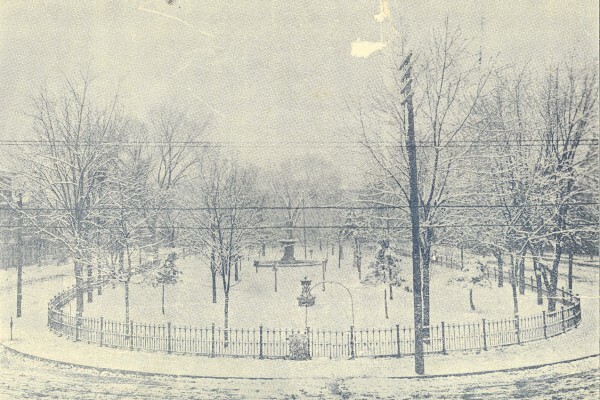 In 1978 the Cemetery was also added to the Parks and Recreation Department. In 1979 the Beautification Division was added to the Department. The name was later change to the Landscape Division once the City Commission abolished the Beautification Commission. Since 1941 the park system has doubled its recreational facilities. Each facility has a special significance or history. The parks are described as being active, this means active recreational facilities such as Lampkin Park, or passive park, such as Fort Webb. Several of the Parks have a historical background. Riverside Park has been leased to the city from J.R. Hines and Associates which started approximately 80 years ago. The contract was $1.00 for 99 years. In 1973 a boat ramp was constructed at the Park. Fort Webb was one of the main fortifications in Bowling Green during the Civil War. Markers are located in this park explaining its historical background. Reservoir Hill is the oldest park in the system. The City purchased the land in1896 from members of the Robert Moore Family. Parks and Recreation offices were located on top of this hill until the winter of 1973 when a fire damaged the building. The offices were moved to Covington Woods Golf Shop and in 1975 moved to the High Street School. Sixteen acres on top of College Knob, as it was originally, make-up the Park. The facilities there are: 2 tennis courts, 3 park benches, 1 picnic shelter, 1 basketball court and playground equipment. Nineteen seventy-three was a busy year for the Parks and Recreation Department. The offices were moved to High Street and two parks were added to the system. High Street , Center (as it is now called) serves several different functions in one building. Besides the main offices, a recreation center for the public has opened and rooms throughout the building are used for instructional programs sponsored by the Parks and Recreation Department or reserved by other organizations. Different sections of the building have been renovated in the past year. Next to the High Street Center is the Roland Bland Park. In 1970 is was purchased and dedicated to Mr. Bland who was the first black coach i n Bowling Green. The park facilities include: 2 tennis courts, 1 softball field,1 volleyball court, 1 junior football field, a caboose donated by the L & N Railroad Company to be used as a piece of playground equipment, 2 playground systems and picnic shelter. In 1992, the Medical Center of Bowling and the City of Bowling Green conducted a swap for Health Insurance coverage for the City of Bowling Green employees for 5 years for the actual land of the High Street Center and Roland Bland Park. The City of Bowling Green owned an Innovation Center which was located at Third and Center Streets that house small business in Bowling Green. In 1993 the Innovation Center was renovated for the Parks and Recreation Administration Offices. The gymnasium and the fitness center remained at the High Street location until 1994, when a state-of-art facility was constructed with 2 High School Regulation Basketball Courts, Wallyball/Racquetball Courts, Game Room, TV Room, Concession Area, Community Center, Special Populations, and Fitness Offices, Conference Room, Community Room and Kitchen, Ceramics Room, Weight Room, Cardio Room, Aerobics Room, and Men’s & Women’s Locker Rooms with whirlpools and saunas. The Roland Bland Park was relocated to 4th & Center Street. The Park consists of tennis courts, basketball courts, sand volleyball courts, restroom facilities and playground equipment. The 53 acre Kereiakes Park was added in 1973. Mayor Spero Kereiakes was an instrumental figure in the development of this park, therefore it was named after him. The 10 tennis courts are the park's main attraction, although there are 2 practice baseball fields, 2 baseball fields, batting cage, 97 community garden plots, a 1.25 mile fitness trail, 18 hole disc golf course, playground system, picnic shelters and picnic areas, and restrooms. The sand volleyball courts were relocated to Preston Miller Park in 2002 when the new entrance to Kereiakes was constructed. The .6 acre triangle Ogden Park is described as being a "neighborhood park". It was donated to the City in 1972 by the Ogden Foundation. Today there are 2 seat swings, 3 park benches and playground equipment. Two parks were in the system, H.P. Thomas and Crestmoor Woods Nature Park were acquired in 1980. H.P. Thomas Park was named after a former Parks and Recreation employee who'd been with the Department for 20 years. The land is located in a residential area in the Southern portion of the City, again, described as a neighborhood park. Facilities on this 17.75 acres are: picnic shelters and playground equipment. The playground equipment was removed in 2000. In FY 2005/06 playground equipment and a Dog Park will be located at the facility. Crestmoor Woods Nature Park was in progress for several years. The 21 acres is set as a nature park. Collegeview was the name tagged to the park by several residents in the area until a committee of 8 to 10 of them were appointed to help in the formal planning of the park. In 1981, Youth Conservation Workers developed the park by building trails and a shelter. The park was renamed in 1997 to the Chuck T. Crume Nature Park. The second division set by the Board of Park Commissioners in 1957 was that of the golf courses. Both Hobson Grove and Covington Woods Golf Courses have a historical landmark in their past. In 1991 the city opened Hartland Golf Course which was the 1st 18-Hole Municipal golf course and in 2003 the City changed the named to CrossWinds Golf Course. Covington Woods was purchased from Charles Smith in 1933 for approximately $40,000. City jail prisoners were used to help construct the nine hole golf course. A clubhouse was also built on the property where a Golf Superintendent lived at one time. The building funds were furnished through the Kentucky Relief Commission in 1934. The original land deal was 45 acres but presently Covington Woods Park is 61 acres which includes: a 9 hole golf course, clubhouse, 2 tennis courts, 1 basketball goal, 1 ball field, 2 picnic shelters and playground equipment. Hobson Grove is the largest park in the system consisting of 223 acres located in the Northwest portion of Bowling Green. Hobson Grove was added in 1965. Facilities at Hobson Grove, besides the 9-hole golf course, are: picnic area, 2 baseball fields, playground equipment and 18 hole disc golf course. In December of 2002, a fire destroyed the Pro Shop and the Maintenance Building. The Pro Shop was rebuilt near the front of the Golf Course entrance and the Maintenance Building was placed in the old location of the Pro Shop in 2005. The golf course now has a practice green, a large patio area and beautiful Pro Shop. The name was changed to the Golf Course at Riverview in 2005. CrossWinds Golf Course is a18-hole golf course on approximately 120 acres. The golf course has a fully stocked Pro Shop with top line rental clubs available. The golf course has made several improvements over the years. In 1993 additional tees and holes were lengthened on eight holes. In 1999 a canvas awning was added to the patio of the Pro Shop. In the spring of 2000 a landscape area was constructed adjacent to #1 tee which was called Pic’s Place. This area was named in memory of Coach Jim Pickens. He was an original employee at Hartland and passed away June 11, 2000. This was done entirely with private donations. In the Spring of 2005 the golf course impounded water in the dry lakes at holes #2 and #12 and renovated the lake at #9 hole including replacing a railroad tie wall with a stone boulder wall. Fountains will be installed in the lakes. Historical Riverview House is located on the 223 acres. It is better known as the Hobson house after its original owner, Colonel Atwood Hobson. The Department had two municipal pools, T.C. Cherry and Parker Bennett, which was the 3rd Division of Parks and Recreation. Parker-Bennett Pool opened in 1974, a year later, T.C. Cherry opened. They both were located next to a public elementary school; "the objective behind this is to coordinate municipal and school recreational programs to provide a full range of recreational programs to the community. This would better utilize the recreational programs offered to the citizens of Bowling Green". The Parks and Recreation Department and the Bowling Green Public School System have been effectively using this theory for a number of years. Parker Bennett pool was deleted out of the system in 1985, due to severe cracking around the pool. A playground system was developed over this area. In 2000, the Russell Sims Aquatic Center was opened. The facility was named after the current Director at the time, Russell Sims. The facility has the largest water playground in South Central Kentucky. The facility consists of zero-depth area with palm trees, water buckets, lemon drops and splash playground. It also features a 50-meter pool, two water slides and two diving boards. The Lovers Lane Soccer Complex and Park was designed by the architectural firm, Chrisman, Miller, and Woodford of Lexington, Kentucky. With assistance from the Southern Kentucky Youth Soccer Association, the City of Bowling Green, and the Warren County Fiscal Court, the $2.5 million dollar facility was constructed in 1995/96. The facility consists of approximately 80 acres, 60 of which serve as game and practice facilities, plus a number of other amenities. Finally, a number of amenities have been developed since the park was opened. Picnic shelters, disc golf course, playgrounds, and an extensive solar shade shelters have been developed on site. The Department also added River Walk Park which is located at 1st Avenue in 2004. The official name was changed to the River Walk at Mitch McConnell Park in July of 2004. The park is named after Senator McConnell for his commitment to the park’s development and financial support of the Bowling Green’s Greenways Project. Future expansion is under development now. The growth of the Parks and Recreation Department in Bowling Green, Kentucky will be continuous. Recreation on a local level has become increasingly popular over the last five years. With the cost of living and gasoline high, recreation has been used as a major source of enjoyment and entertainment. It will be interesting to see if the park facilities will be doubled again in the year 2121 as they have been these past 40 years. The current Bowling Green Parks and Recreation Department has 60 full-time and 191 part-time and seasonal employees. These employees maintain 944.2 acres and provide recreational activities at 24 parks facilities. This includes 16 volleyball courts/practice areas, 17 tennis courts, 14 basketball courts, 18 softball/baseball game/practice fields, 20 soccer/futbol fields, 11 picnic areas, 13 picnic shelters, 19 playgrounds, 4 disc golf courses, 3 golf courses, 5 walking/fitness trails, 55 restrooms, 2 recreation centers, 1 fitness facility, 2 racquetball courts, 97 garden plots, 8 Historic Sites, 1 dog park, 1 swimming pool and other amenities located at our parks or facilities. 1988 Governors Award -1st Place Outstanding Department 1989 Kentucky Special Olympics "Torch Award". 2002 Customer Loyalty Award - Top 10 Facility for Overall Customer Loyalty and Satisfaction – Municipal Category awarded by the National Golf Foundation for Crosswinds Golf Course. History of Parks & Recreation in Bowling Green & Warren County, written by Paul Walker. Park Statistics, compiled by Pat VanHook, 1981. City Ordinance, March 3, 1941, Section 331, 332, 333, City Code 1929. Newspaper clippings obtained from the file on Parks located in the Kentucky Museum. Ordinance 297, Kentucky Revised Statutes, Section 97.010 through Section 97.050. Outline of Bowling Green Parks & Recreation Department by Gary Dillard.